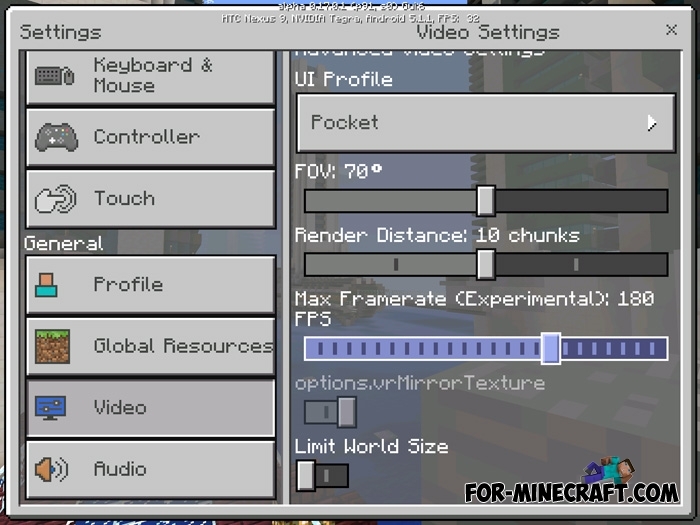 Unfortunately, the new Minecraft PE 0.17.0 has a limited frame rate, and at the same time you can't change it. For this reason, the game may not work correctly and to lag. To avoid this, you can install the Max Framerate addon and increase your FPS in MCPE 0.17 in the way you want. Do not forget, the game speed depends directly on the characteristics of your device. Download and install this addon. After that, is required to restart the game. Then run the Minecraft and go to the graphics settings. Scroll down and you'll see a special slider (shown in the screenshot). Using it you can change the frame rate for optimum performance. To really see and verify the functionality of addon, set the minimum frame rate and go into the game. You will notice the difference immediately. Or see a demonstrative video below. How to install the Max Framerate addon? Install it as a resource pack in the game menu.